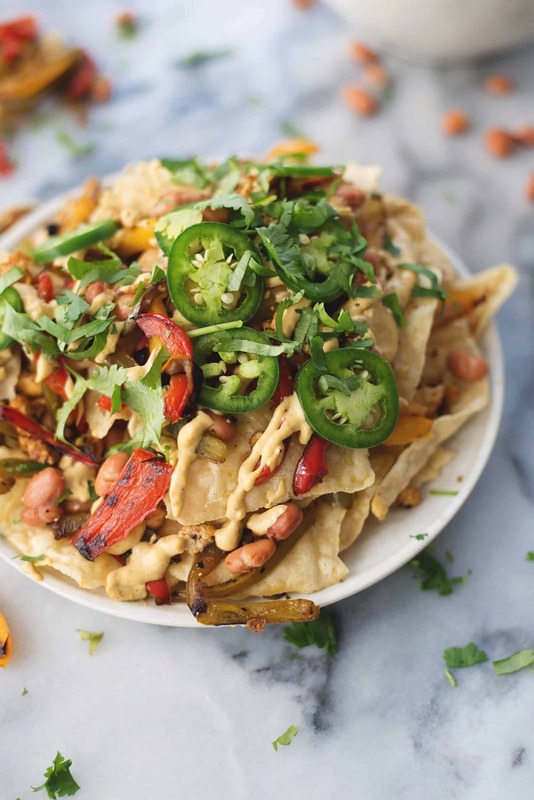 Fajita Vegan Nachos! 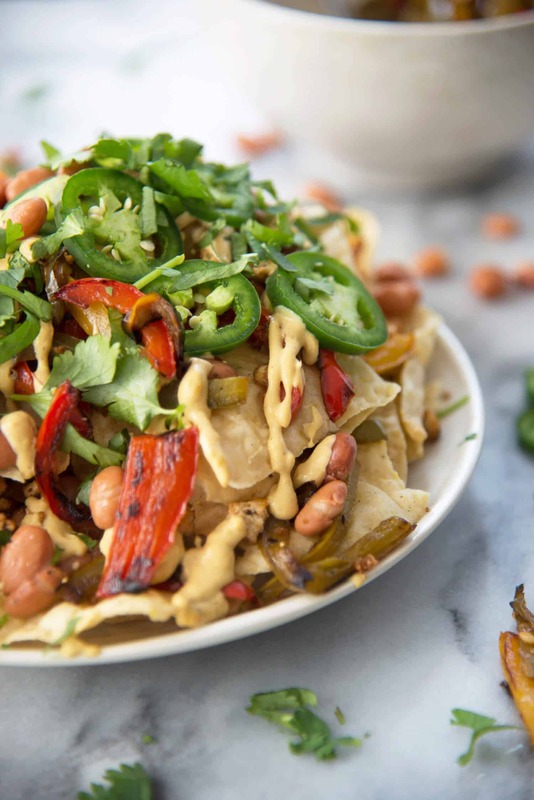 The ultimate plant-based nachos. 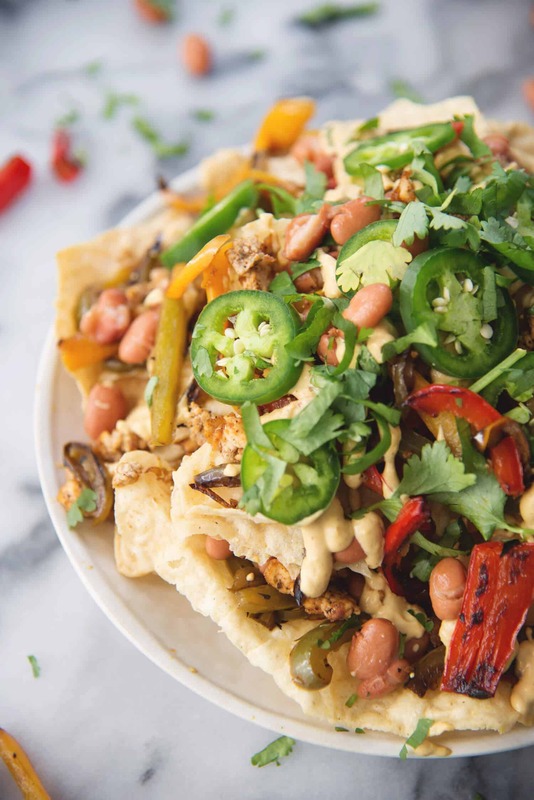 Tortillas, chewy taco tofu, seasoned peppers, homemade cheese sauce, pinto beans and more! Hey almost Super Bowl weekend, I’m coming for you! Well, with food. 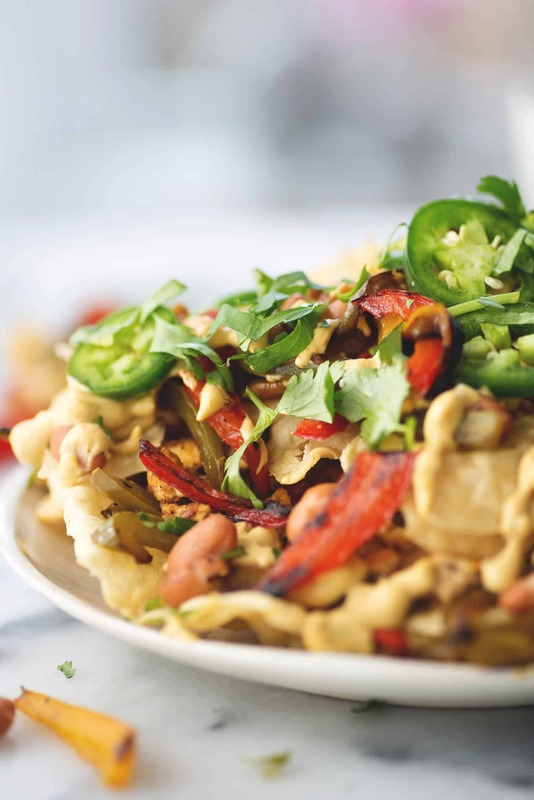 Specifically, these fajita nachos which are loaded with all the good stuff: sautéed peppers and onions, spicy tofu taco meat, pinto beans, creamy dairy-free cheese sauce, chips, herbs and avocado. I can down an entire plate of these in one sitting and still want more. They are the perfect answer to almost all cravings: crunchy, spicy, hearty and salty. 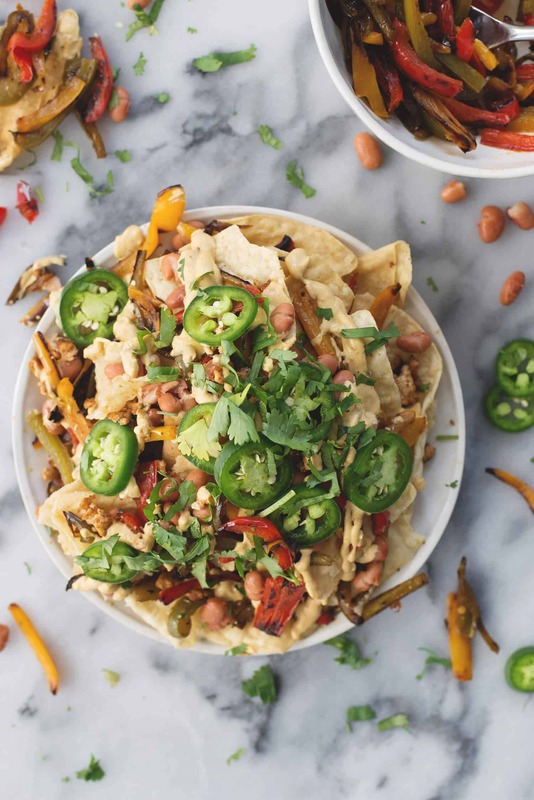 Since my savory-tooth is much bigger than my sweet-tooth, I crave these nachos almost weekly. I first created them a few weeks ago when the Packers were playing their hearts out for SB gold. As BL is still a die-hard Packer fan, I try to make those Sunday evenings as special as possible. Whatever food he requests, maybe a margarita or two, and me far, far away from the couch. BL always wants Mexican. Always. He usually rotates between a build-your-own burrito/taco bar, quesadillas, tortilla soup or nachos. 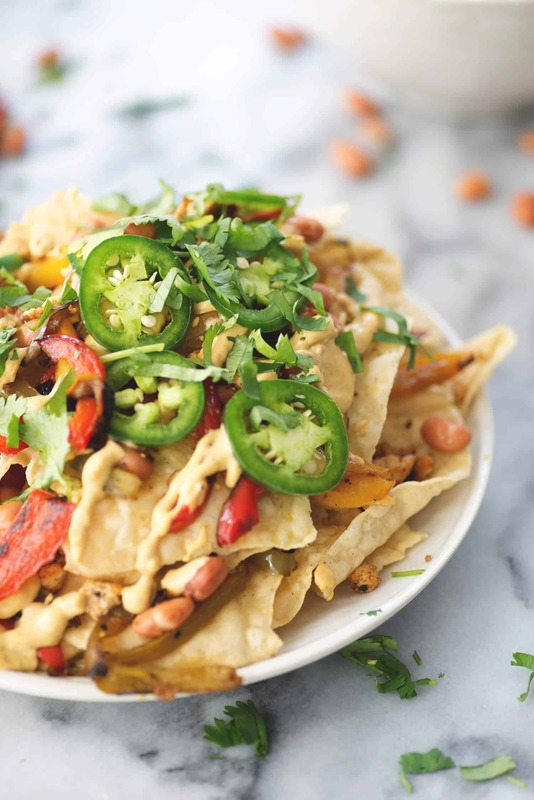 I want to eat everything; so we compromise, with these piled-high-with-everything nachos. The secret is getting the tofu meat just right. First, you have to press it. Use a fancy press, use a heavy book, whatever works- just press it for at least 15 minutes. Then, heat a cast-iron skillet with a bit of olive oil over medium-high heat. I’m sure other skillets work, but I can’t imagine cooking this without my trusted cast-iron. Crumble the tofu into the skillet, then use a wooden spoon to break up any chunks. Stir, stir and stir, until the tofu is really chewy and almost no moisture remains. It should resemble the texture of cooked, ground turkey. Even though BL insists that he hates tofu, he eats it like this all the time and is none the wiser. Seriously, he thinks I just make “taco meat” in the kitchen. Sorry bro, it’s tofu. One last secret for perfect nachos- layer, layer, layer. I start with a handful of chips, toppings and cheese sauce, then repeat. 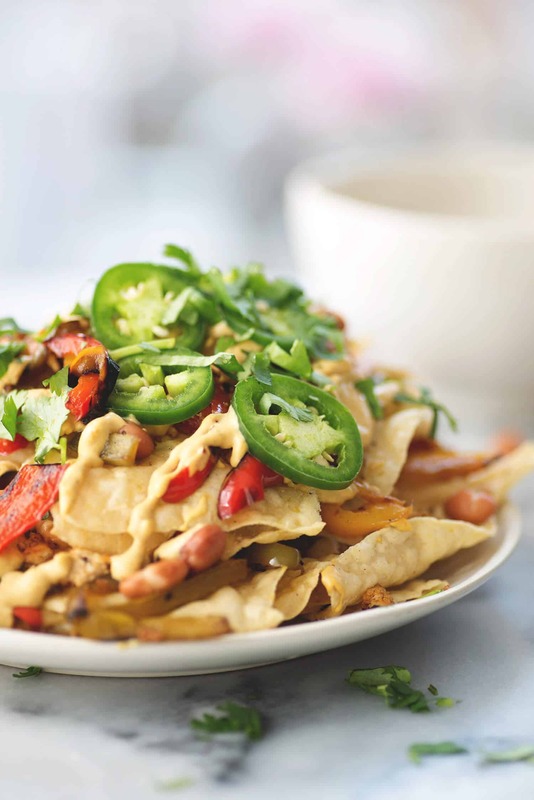 Consider nachos like lasagna and you are guaranteed to get a yummy bite every time. Heat the olive oil in a large skillet over medium heat. Crumble the tofu and add in the fajita seasoning. Cook, stirring often, until tofu is dry and slightly crispy, about 8-10 minutes. Set aside. Heat the remaining olive oil in the skillet. Add the peppers and the fajita seasoning and cook until softened, about 10 minutes. Wipe out the skillet and set aside. Place the drained cashews, orange pepper, almond milk, chili powder, nutritional yeast and a pinch of salt and pepper in a blender and puree until creamy and smooth. Taste and adjust as needed for seasoning. Place the cheese sauce into the skillet and cook another minute or two until warmed and thickened. Layer the chips, cheese sauce, peppers and tofu in a large platter. Top with beans, jalapeños, remaining peppers/cheese/tofu and dollop with guacamole. I read your blog on Feedly and lately your content has been replaced by poorly written posts that are not from you…thoughts?? I love your content! That’s how I knew these weird ones weren’t authentic. I deleted the blog on my feedly and found it again and now it’s correct. I’m going back and reading all the posts I missed. I have no idea what happened!